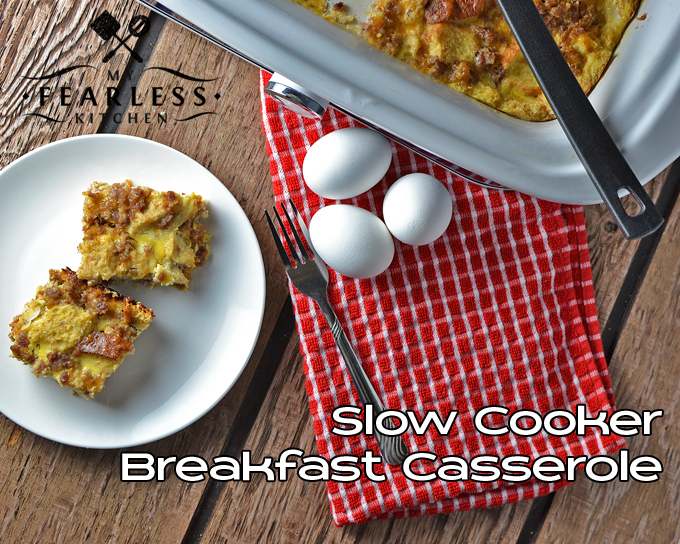 Make this Breakfast Casserole in your slow cooker for a hot, yummy breakfast that doesn’t involve standing over the stove all morning! 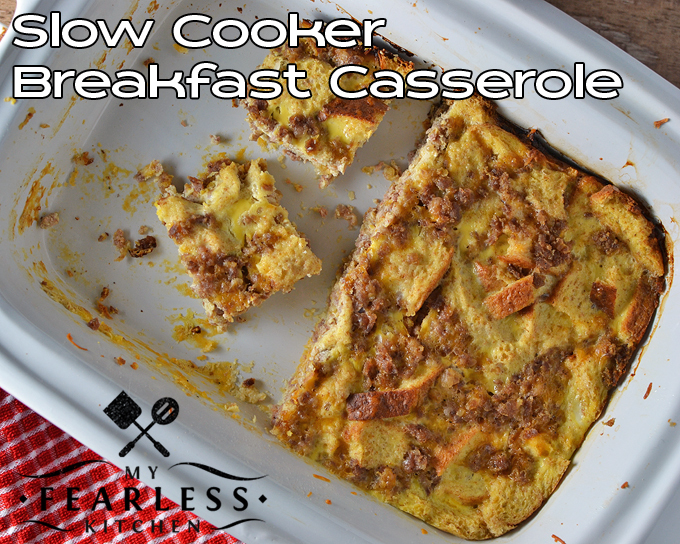 This Breakfast Casserole is John’s favorite breakfast! It’s tradition that we have it for breakfast on Christmas morning and Easter morning, but we rarely have it any other time. 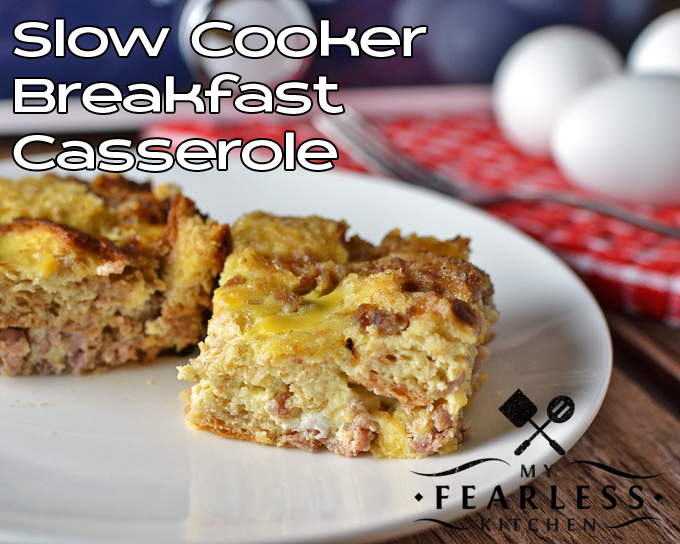 I decided that it was time for me to try to combine his favorite recipe with my new favorite cooking technique (the casserole Crock Pot), and the Slow Cooker Breakfast Casserole was born. It’s so easy to put together, there is really no reason why we only have it for special occasions! And speaking of favorite things, one of Little Doc’s (he’s too big to call him Baby Doc anymore!) absolute favorite things is to play on the tractors. He really loves the Tractor Mac series of books, and he got the Tractor Mac DVD for Christmas. I swear, he can almost quote that movie word-for-word to me now! 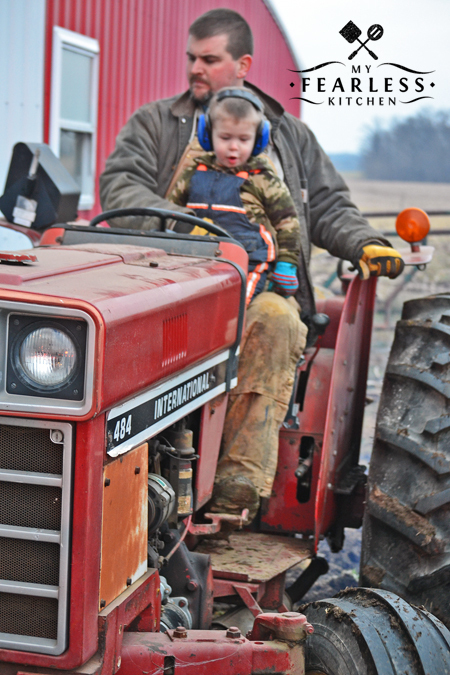 He has learned a lot about tractor parts from that movie, the books, and from spending time in the barn with John. While Little Doc does really enjoy reading books about tractors, he likes hanging out with Daddy and the real tractors on our farm even more. He gets so excited when it’s time to go out to feed the cows! He knows the name of the tractor we use at our house to feed the cows (the Allis, as in Allis Chalmers) and the name of the tractor we use at the other farm to feed the cows there (the Fiat). I didn’t learn those names until he started teaching me! It’s been so amazing watching this little man grow up, and watching his interests develop. 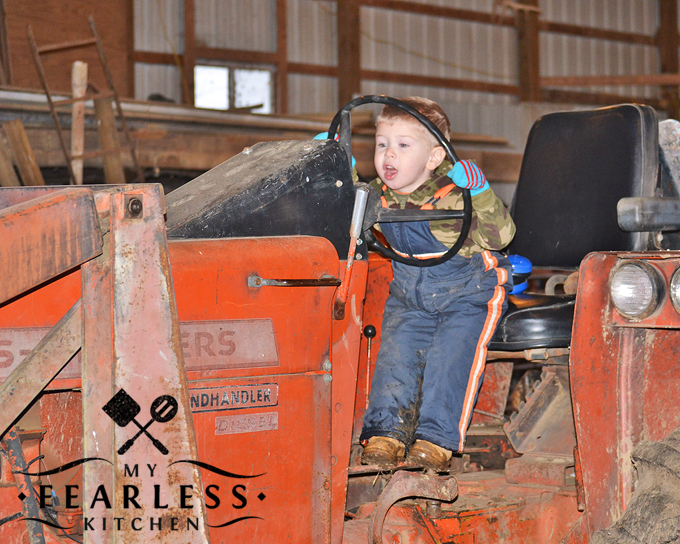 I never – in a million bazillion years – would have imagined that I would be raising a tractor-loving boy! He is really making me stretch my boundaries, and get muddy, way more than I expected. But this recipe… this is something that John, Little Doc, and I can all agree is pretty awesome. It’s so easy to put together. Brown up some ground pork. Scramble eggs, milk, and salt. Add the sausage and some cheese. Pour it all over bread that was torn into chunks. Cook. I love it because it’s easy. John loves it because it’s tradition. Little Doc loves it because it tastes good! Unfortunately, this is not a breakfast casserole that you can set up the night before and let cook all night long. By all means, do get it set up the night before, but refrigerate it overnight. If you do that, it will take a little longer to cook, so plan ahead! This took about 3 hours to cook in my Casserole Crock Pot on low. Keep an eye on it after the 2 hour mark. You’ll be able to tell it’s done when the eggs are set, and a toothpick tests clean from the center of the casserole. Of course, the best way to be sure it’s completely cooked is with a food thermometer. In any casserole, you’re looking for a temperature of 160 degrees F in the center of the dish. Check out this post to download a free printable with the recommended minimum cooking temperatures for all your food! I used whole wheat bread in this recipe, because that’s what I usually buy. You can use whatever kind of bread you want, whole wheat, whole grain, multigrain, or simply plain old white. Whatever floats your boat! What is your family’s favorite traditional food? Why do you only have it for special occasions? Have you ever wondered if your eggs are still fresh? In general, eggs will stay fresh for about 1-2 weeks after the date stamped on the carton. But if you aren’t sure, or want a better way to check, try this simple tip! A classic breakfast casserole, with a twist! Mix everything together in your casserole slow cooker for an easy breakfast the whole family will love. Layer bread chunks in the bottom of a casserole slow cooker. In a bowl, whisk eggs, milk, and salt together until combined. Fold sausage and cheese into egg mixture. Pour egg mixture over bread in slow cooker. Cover, and cook on low for 2-4 hours until eggs are set.